JC. Brunk called Jubilee King the best horse he ever bred. Others commented on his royal presence. 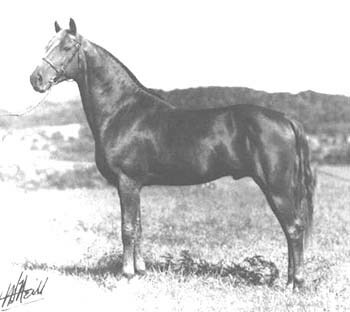 With 5 crosses to Daniel Lambert within 5 generations, Jubilee King became an outstanding sire of the Lambert bloodline. 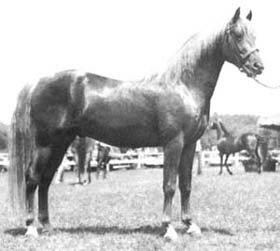 Jubilee King was used strictly as a working ranch horse and never entered a showring. 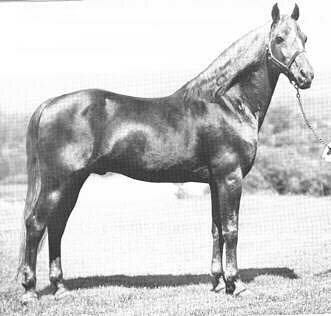 He sired 84 morgan foals, 59 for the Brunk family. He also spent 7 years on the Texas ranch of Tom Burnett where he appeared in the pedigrees of several quarter horses. His stint in Texas apparently exacted a toll and the horse was retired from stud at the age of 21. He spent his golden years on Frances Bryant's Serenity Farm until he passed at 29. Jubilee King was especially revered for passing on his great feet and legs, strong backs, loins and gentle dispositions. His dynasty contined through good daughters, like Paragraph, and through several good sons. 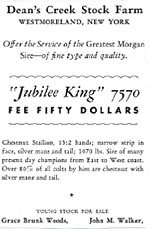 King de Jarnette, McAllister and Ken Carmen are found in the pedigrees of many top notch working western morgans. His most prominent son was Jubilee Courage. He sired Cathy Serenity, the dam of 4 time World Champion Bennfield's Ace. 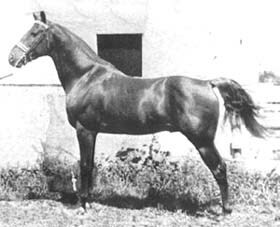 He was also the sire of Criterion, whose blood runs in th horses of the Quietude Stud.